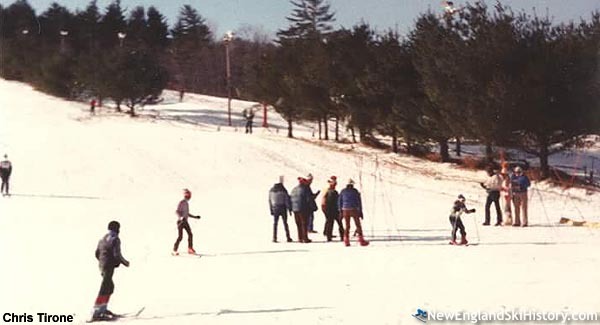 Located just south of the New Hampshire border, 331 foot Powwow Hill was home to lift served skiing for nearly half a century. The earliest known reference to lift served skiing is from the 1946-47 season, in which a floodlighted, tow-served slope was open. It is not known if this was on Powwow Hill, or if this was a reference to Lone Tree Hill (which later became home to the New England Sports Park tubing hill). By the time the 1948-49 season rolled around, Everett Locke had three rope tows operating on Powwow Hill, boasting improved night skiing lighting. In addition, there are references at the time of a new 'hill' being used. An early 1950 Boston Globe article refers to "two hills, side-by-side, each with its own tow set up, and both good medium length runs." The popularity of the area grew, drawing more than 1,000 skiers on a single day in 1951. A new parking lot has recently been added, as well as "music to ski by." 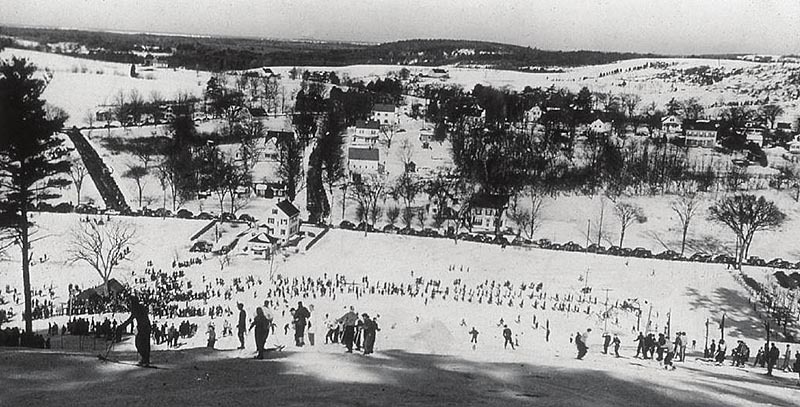 At the start of the 1952-53 season, the Boston Globe referred to Locke's Hill as "the North Conway of northeastern Massachusetts, because of its perfectly groomed slopes, and the long run from the top." Allie Gray was listed as the manager in 1952-53 and Don Langeley in 1953-54. Keeping up with its reputation for smooth skiing, a new snow cat was purchased for the 1957-58 season. In December of 1961, Amesbury Ski Tows, Inc. and Locke Realty, Inc. were incorporated. In January of 1962, Everett Locke sold the ski area to Locke Realty, Inc. In a related transaction later in the year, Joseph Deschenes was listed as the President of Locke Realty. Deschenes was also known as "Donnie." The area was still advertised in some places as Locke's Hill during the 1962-63 season, featuring 4 tows. Moving forward, however, it took the name of Amesbury Ski Tows. By the time 1965 rolled around, Amesbury had grown to 6 tows. For the 1968-69 season, two Pomalifts were installed at the ski area. Snowmaking reportedly was installed at the area for the devastating 1979-80 season. During the 1986-87 season, Amesbury saw its name changed to Atlantic Forests. Deschenes's Amesbury Ski Tows, Inc. and Lockes Realty were dissolved in March 1987, whilst David Marcus's Atlantic Forests Ski Area, Inc. was incorporated in April. During the late 1980s, Atlantic Forests advertised 5 trails, serviced by 3 lifts and 80 percent snowmaking coverage. Atlantic Forests continued to operate into the 1991-92 season. There are no known references to operation in 1992-93. By the time 1994-95 rolled around, the ski area was listed in an article about local operations that had fallen by wayside. 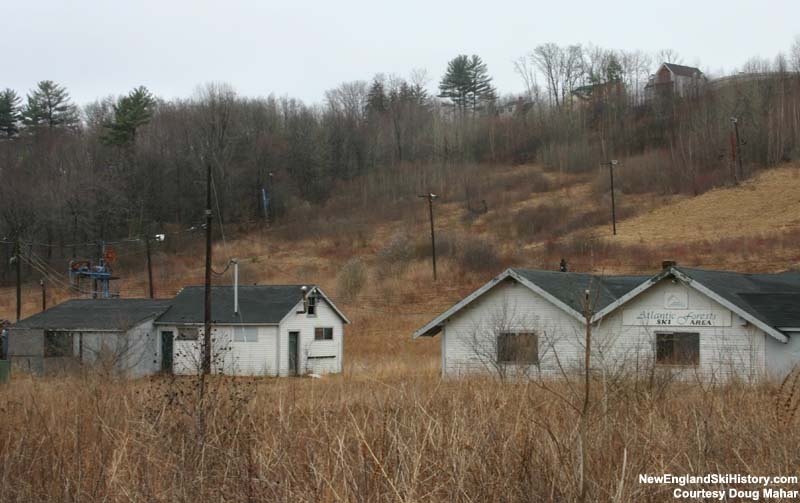 In subsequent years, housing has been developed on portions of the old ski area. "I lived at 6 Vine Street and could look from my back porch and watch the skiers. My property met up with the Terrio family’s land." "I learned how to ski here in 1982. Made the front page of the Daily News with my red plastic skis on at the age of two. Skied this hill till they closed. My mom worked in the office at night and we skied. My uncle Tony Wallaga was ski patrol. I have so many memories on this hill. I wished I could have shared them with my children here as well. "